ProEasy™ is a modified baculovirus genomic DNA which drastically improves upon traditional baculovirus technologies in terms of simplicity of operation and reliable high levels of target protein expression at scale-up of protein production. Due to the simplicity of operation it is also ideal for high throughput applications. Refer to Baculovirus tutorial for simple step-by-step instructions. The improvement is achieved because parental ProEasy™ baculovirus contains a gene knockout that does not allow virus replication under standard conditions which are used for generation and propagation of recombinant baculoviruses (Fig. 1). Therefore, any possibility of background, i.e. contamination with parental nonrecombinant baculovirus has been eliminated. ProEasy™ cannot initiate an infection in insect cells unless it undergoes recombination with a plasmid vector DNA encoding a protein of interest. The commercially available ProEasy™ DNA is also linearized using Bsu36.I restriction endonuclease to favor recombination with the transfer vector. Insertion of a gene of interest occurs into the polyhedrin site of baculovirus DNA under the control of strong polyhedrin promoter. This provides for the highest possible rate of target protein synthesis in the baculovirus system. Fig. 1. Comparison of core and ProEasy™ technologies. A. Core technology. 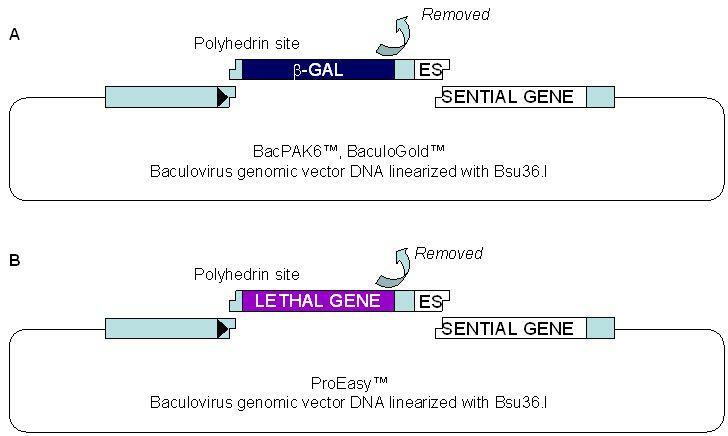 Polyhedrin site in the parental baculovirus is occupied by the E.coli b-galactosidase gene which is removed using Bsu36.I digestion in commercially available BacPAK6™ and BaculoGold™ vectors. Small amount of parental baculovirus arising from undigested DNA could contaminate baculovirus progeny after transfection as it efficiently propagates. B. ProEasy™ technology. Polyhedrin site in the parental baculovirus is occupied by a lethal gene which does not allow propagation of parental baculovirus. Therefore, obtained recombinant baculovirus stocks are 100% recombinant. Recommended plasmid transfer vectors. A large selection of plasmid transfer vectors is available from AB Vector for the use with ProEasy™ baculovirus genomic vector DNA (Fig. 2). All plasmid transfer vectors have the same "backbone" that allows replication of plasmid DNA in E.coli and differ only in the part downstream of the polyhedrin promoter. A target protein can be expressed with a GST, His, GFP, MBP or dual His/ MBP, or FLAG/His tag or expressed without a tag using the pVL1393 plasmid vector. We also offer plasmid transfer vectors with a highly efficient signal sequence (pAB-bee™, pAB-bee™-8xHis, pAB-bee-FH™) to facilitate expression of secreted and membrane proteins. C-terminal tags are optional contingent upon a stop codon at the end of the target gene ORF; to provide an example pAB-bee™ vector is shown twice with the target gene cloned with or without C-terminal His tag. Up to 3 target proteins can be expressed using pAcAB3 vector (not shown). Any plasmid transfer vectors that are compatible with BacPAK6™ and BaculoGold™ vectors are also compatible with ProEasy™ DNA. Fig. 2. Plasmid transfer vectors compatible with ProEasy™. Target gene can be cloned into any of these plasmid vectors and transferred by “forced recombination” into ProEasy™ baculovirus genomic DNA. Click on the vector name link below for detailed information on the vectors. Table 1. Plasmid transfer vectors from other suppliers compatible with ProEasy™. ProEasy™ advantages over other baculovirus technologies. Recombinant baculovirus stocks obtained using core baculovirus technology always contain small amounts of nonrecombinant baculovirus. Therefore, purification of virus stocks by terminal dilution or by plaque-purification is recommended, especially if a target protein is cytotoxic or if the stock is used for large-scale protein production. In this case a small amount of parental baculovirus could expand in the virus population as the result of a selective advantage over a recombinant baculovirus expressing a target protein that may propagate less efficiently. However, plaque-purified BaculoGold™ or BacPAK6™ virus stocks are reliable over many passages and trouble-free for continuous use in laboratory practice. Invitrogen's bacmid-based technologies, in particular Bac-to-Bac™ are often preferred as they facilitate generation of practically 100% of true recombinants after transfection. However, due to the presence of transposon sequences, Bac-to-Bac™ recombinants reportedly could be unstable, resulting in the deletion of a gene of interest from a recombinant baculovirus and reduction and eventual loss of recombinant protein expression during virus propagation (Pijlman G.P. et al., J. Gen. Virol., 84: 2669-2678, 2003). This effect could be especially pronounced if a target protein is slightly cytotoxic or initially overexpressed. Such stocks cannot be reliably remedied by stock purification, as the recombinant baculovirus is inherently unstable due to the presence of transposon sequences (details). ProEasy™ technology is devoid of these disadvantages. It facilitates generation of 100% pure and stable recombinant baculovirus stocks. Recombinant baculoviruses obtained using ProEasy™ technology do not contain any genetic elements such as transposons that can cause instability of the recombinant baculoviruses. Furthermore, generation of recombinant baculoviruses using ProEasy™ is more straightforward then using other vectors and involves simple manipulation (Baculovirus tutorial). To the best of our knowledge the product does not have genetic pathogenicity or spread characteristic different from other baculovirus vectors for protein expression in insect cells. pTriEx™, pBAC™, BacMagic™, BacVector™ are trademarks of Novagen, BaculoGold™ is a trademark of BD Pharmingen, flashBAC™ and pOET™ are trademarks of Oxford Expression Technologies (OET), BacPAK™ is a trademark of Clontech, Sapphire™ is a trademark of Orbigen.